MOBile NETwork for people's location in natural and man-made disasters. The most accurate, fast and easy method to locate people in search and rescue operations. Numerous approaches are used in current Search and Rescue (SAR) systems. For example for the location of isolated victims using chemical substances detector, unmanned terrestrial robots, thermal imaging, dogs, etc. However, there are situations in which rescuers do not know if there are people in the zone using these methods because they have no direct access to that area, e.g. in mountain areas, unstable areas after a disaster (earthquakes, hurricanes, large snow storms) and normally the time necessary to find survivors is the key the rescue . Additionally enter in the disaster site might not be safe for the rescuers, such as a nuclear plant disaster. MOBNET is a SAR system integrated within UAVs that provide continuous monitoring of the affected area at low cost. Furthermore, it is easily and quickly deployed, posing no risk to the life of the rescuers and PPDR services, independently of the heavy weather conditions, the malfunction of technical parts or human errors. Likewise, it does not require special training or qualifications to control the UAVs. The system fast the process of locating survivors in vast areas. 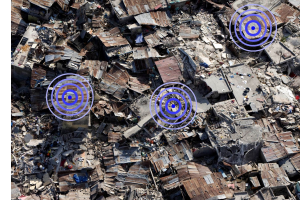 The main objective of MOBNET is to locate isolated victims during natural disasters and situations of emergency such as earthquakes, hurricanes or large snow storms. MOBNET also helps first responder services to find fugitives or smugglers hidden in buildings. To that end, the use of EGNSS (both Galileo early services and EGNOS) and DCT (Digital Cellular Technologies) plays a key role. MOBNET is perfect for situations where it is difficult, dangerous or even impossible to access the affected areas. Find more information in MOBNET website or contact us for commercial purposes.